Die Hülse ist NEU und ORIGINALVERPACKT ! 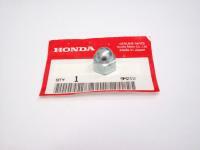 New genuine Honda Part ! Das Gummi ist NEU und ORIGINALVERPACKT! 1x Nut Cap Rear Cushion Shocks for the Honda models listed above ! New genuine Honda part ! TOP Quality !! !